Back row, left to right: O'Soup (Chippewa Chief) and Peter Hourie. Front row, left to right: Ah-tah-ka-koop (Starblanket), Kah-kiwistahaw (Flying in a Circle), Mistawasis (Big Child). Photo taken on October 16, 1886, on their visit for the unveiling of the Brant Memorial, October 18, 1886. Chief Ahtahkakoop (Starblanket) led his people through the difficult transition from hunter and warrior to farmer, and from traditional Indian spiritualism to Christianity during the last third of the 19th century. A Plains Cree, Ahtahkakoop was born in the Saskatchewan River country in 1816. He was raised during the era when millions of buffalo roamed the northern plains and parklands, and developed into a noted leader, warrior, and buffalo hunter. By the 1860s, the buffalo were rapidly disappearing and newcomers arrived in greater numbers each year. Ahtahkakoop realized that the Children and grandchildren in his band would have to adopt a new way of living if they were to survive. Accordingly, in 1874 the chief invited Anglican missionary John Hines to settle with his people at Sandy Lake (Hines Lake), situated northwest of present-day Prince Albert. Two years later, Ahtahkakoop officially chose this land for his reserve. 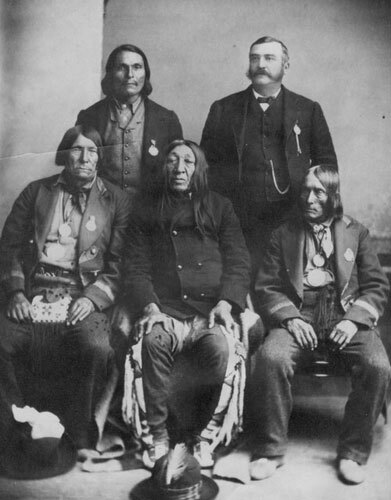 Ahtahkakoop was the second chief to sign Treaty 6 at Fort Carlton in 1876. Supported by the chief and his headmen, Hines established a school for the children and taught their parents how to farm. The children did well in school. Two of Hines' first students, Ahtahkakoop's nephews, became qualified teachers, and two great-nephews were ordained as Anglican priests. Hines prepared the adults for baptism; gradually most families converted to Christianity. Meanwhile, the families were increasing the number of acres cultivated and sown, raising herds of cattle, and building substantial homes. Unfortunately, the crops were often destroyed by frost, hail, and Drought. Hunting was poor, and the people sometimes starved despite their hard work; additionally, restrictive government policies made life difficult. Ahtahkakoop and his people remained neutral during the uprising of 1885, determined to honour the treaty signed nine years earlier. Ahtahkakoop died on December 4, 1896, and was buried on the reserve that was named after him. Christensen, D. 2000. Ahtahkakoop: The Epic Account of a Plains Cree Head Chief, His People, and Their Struggle for Survival, 1816-1896. Shell Lake, Saskatchewan: Ahtahkakoop Publishing.